The diagram below shows the typical characteristics of the upper course of a river valley. Cauldron Snout on the River Tees. Vertical erosion has led to the formation of this landform. Interlocking spurs are fingers of land that jut out into the river valley that streams and rivers are forced to flow around in the upper course. Rapids are fast flowing, turbulent sections of the river where the bed has a relatively steep gradient. They are found in the upper course of the river. Rapids form when there is vertical bedding which is when alternate bands of hard and soft rock cross the channel. Differential erosion will occur as the soft rock is more easily eroded than hard rock. This makes the riverbed uneven and a river’s flow becomes turbulent leading to white water sections typical of rapids. Waterfalls commonly form where water rushes down steep hillsides in upland areas. They are typical of the upper valley but can be found in the rivers lower courses. The height and number of waterfalls along a stream or river depend upon the type of rocks that are being eroded by the water. This typically occurs in areas where alternating bands of rock, made up of soft and hard rock, form the bedrock. Some types of rocks (shale, for example) wear away more easily than others (such as sandstone or limestone). Waterfalls form when water falls onto soft rock after flowing over hard rock. Falling water and rock particles erode the soft rock below, forming a plunge pool. Processes of erosion, such as hydraulic action, abrasion and corraision further erode the plunge pool and the back wall of the waterfall, undercutting the hard rock above. eventually, the hard rock will no longer be supported and it will collapse. The waterfall continues to retreat leaving behind a steep-sided gorge. The diagram below shows the formation of a waterfall. The video below shows an overhang beneath Summerhill Force waterfall, Bowlees, Teesdale. Another example of a waterfall is High Force on the River Tees. At 22 metres it is the tallest waterfall in England. 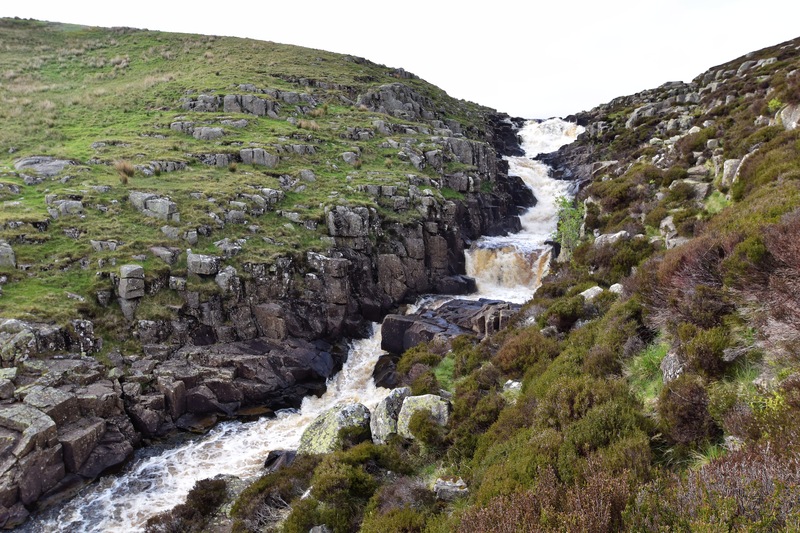 The River Tees tumbles over the Whin Sill, a layer of a hard rock called dolerite, which is known locally as whinstone. This resistant rock lies on top of softer sandstone, shale and limestone. The retreating waterfall has created a gorge 500m long. Below is a video featuring Skógafoss which is a waterfall situated on the Skógá River in the south of Iceland at the cliffs of the former coastline. A gorge can be formed as a waterfall retreats up a valley. This happens when a river flows over a band of hard rock that lies over the top of the softer, less resistant rock. The river rods the softer rock faster, through hydraulic action and abrasion. This erosion leads to the undercutting of the softer rock. Over time an overhang of hard rock forms. Eventually, the overhang collapses as it cannot support itself. This process repeats causing the waterfall to retreat upstream, leaving behind a steep and narrow gorge. A gorge on the River Swale, Yorkshire Dales.